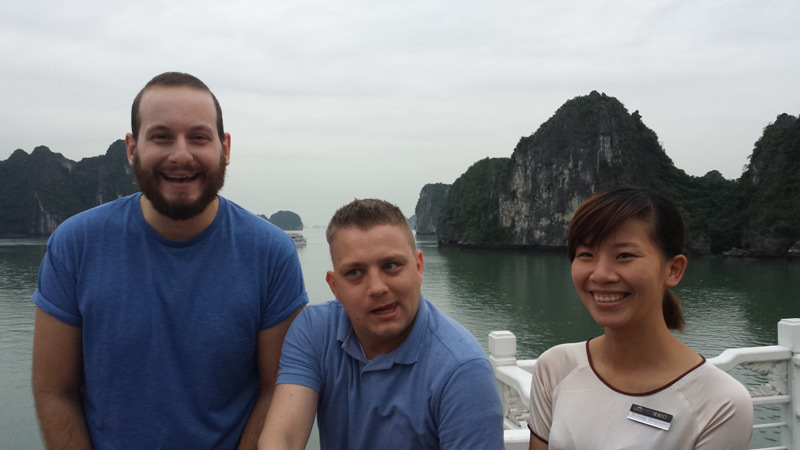 Tom Cranshaw, our Product Executive, recently returned from a whistle stop Vietnam tour on an educational trip sponsored by Vietnam Airlines. Visiting islands and areas which are only just starting to become popular with tourists, read his trip report below to inspire you on your Vietnam tour. One of the purposes of this familiarisation Vietnam tour was to try out the direct Vietnam Airlines flight from London Gatwick to Saigon. On the outbound we flew Deluxe Economy class and on the inbound flight we flew in Business class. The flight was approx 13 hours each way. The Deluxe Economy seats are approx 37”. There was a number of in-flight films available with private screens, as well as TV programmes, music and games. We were given two meals on the flight: evening meal and breakfast. For the evening meal, there was a choice of two dishes, pork or chicken; for the breakfast there was a choice of English breakfast or an Asian style pork noodle breakfast. The Business class seats are approx 62” and could recline into a bed of around 160 degrees. The same entertainment was provided as in deluxe economy but there was a choice of watching the films on an iPad which could be provided by the air staff, giving you a better picture and sound quality. Again, there were two courses provided: both evening meal and breakfast. Both meals had a starter, main and dessert. An array of bread was provided with each meal. There was a choice of western or European dishes for each course. Hot towels and drinks were provided throughout the flight. We arrived into Saigon and transferred directly to a flight to Phu Quoc. The flight from Saigon to Phu Quoc was under an hour. On arrival, we were met by the Salinda Resort representative who transferred us 10 minutes to the hotel. 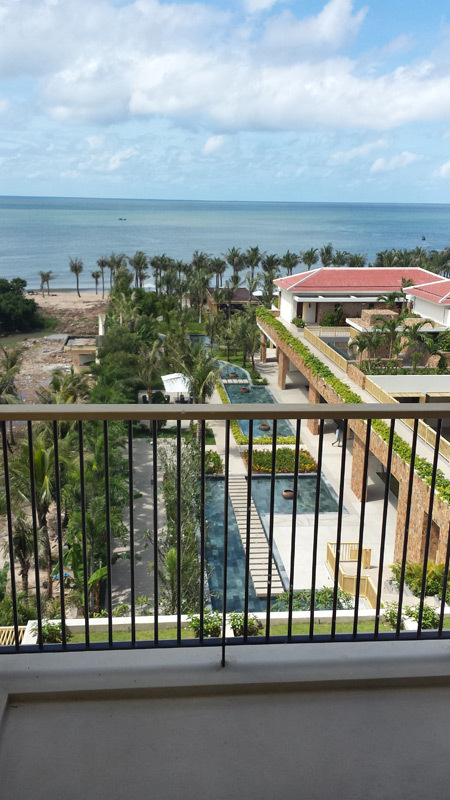 The Salinda Resort is a brand new 5* hotel located on the coast of Phu Quoc. The resort had its own private beach, an infinity pool, free personal trainers and a luxury spa. The standard room which we stayed in had a private balcony, with choice of inland or ocean views. The bedroom was two double beds put together with a length of approx 6ft 4”. The bathrooms did not have a bath but had a large shower. On arrival we were provided with 4 taster drinks made from local fruits. We were then given a tour of the hotel rooms and the bars and restaurant. We had both lunch and evening meal in the hotel where we were provided with a 5 course dinner for each, including a salad, a soup, two warm meals and a dessert. The hotel had widescreen televisions, free wi-fi and personal speaker which you could plug your iPod into. There was also the option of renting out bicycles for free. Phu Quoc is a very beautiful, tropical island which offers a beach experience similar to the Thai Islands. There is a lot of vegetation on the island and there is a peaceful atmosphere with few people. I did not see many restaurants and bar options outside of the resort, however I think there is another section of the island where there are options for evening entertainment. However, I would definitely recommend Phu Quoc for a nice beach extension and the Salinda Resort definitely offers a 5* luxury experience. The next day we flew to Hanoi; the flight took 2 hours. Hanoi is a bustling city of around 8 million people. The city, in my opinion, had a very unique and exciting atmosphere. The city for me felt like a city from China, yet the colour and architecture present all over gave Hanoi a very beautiful and unusual look. With such a large population, the houses and people seemed on top of each other, yet it did not feel over-crowded. The number of mopeds on the road is one of the most extraordinary things I have ever seen. There seemed to be more mopeds than people however the traffic continued to move, the epitome of organised chaos! The people are extremely pleasant and welcoming, yet have that cool sophistication of true city slickers. On arrival, we were met by our guide John. John was a fantastic guide who had a perfect grasp of English, telling us jokes and giving us an introduction to Hanoi. Our coach was an 18-20 seat coach and we had lots of space inside. The transfer from the airport to the city centre was around 1 hour. We first went to a restaurant in the Old Quarter called Indochine. We were provided with a fantastic 5 course meal which incorporated tastes from both Vietnam and France. 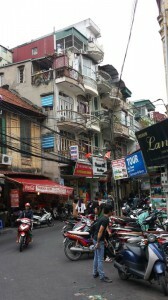 We then transferred around 20 minutes to our hotel, the Lotte Hanoi where we stayed for 2 nights. The Lotte Hanoi is a 5* hotel and is located in the second tallest building in Hanoi. The Lotte Hanoi was the most luxurious hotel we stayed in during our trip and offered views all the way across Hanoi. On arrival into the hotel, we were offered a welcome cocktail and we were then shown to our rooms. The bedroom was very spacious with a king-sized bed, a large bathroom with bath and a stunning view of the city. The staff were very attentive and polite. In the evening, we watched a private Water Puppet show. We were taken to a puppeteer’s house in the backstreets of the Old Quarter. His house was built over 4 floors. On the second floor, we were provided with a welcome presentation and a history of the water puppets. The next floor was his work shop where he made water puppets and the top floor was an inside water puppet stage (a large pool filled with water and a background of a typical Vietnamese cityscape). The show was very interesting and he not only showed traditional puppet performances but also added modern sections to it. After the show, we had a late dinner which was a menu of European food which was very tasty. We then went out to the Old Quarter to check out a couple of the bars; it was a lot of fun and I was surprised by the amount of backpackers there, not dissimilar to Bangkok. The next day in Hanoi we started our day at the Ethnology Museum. Our guide John gave us a very detailed and informative talk on the 53 minority groups of Vietnam. We saw minority group items such as instruments, cooking utensils and farming tools. We also were given information on celebrations of the minority groups, funeral processions and wedding celebrations. The museum is made up of an inside and outside section. The outside section is a beautifully laid out park with a number of minority group house styles, as well as a large outdoor water puppet stage. 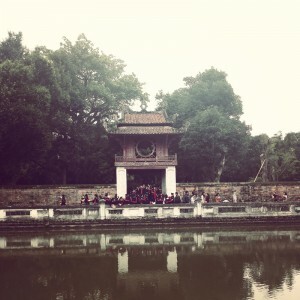 We next went to the Temple of Literature, a Confucian temple dating back to the 11th century. The Temple of Literature is an important place historically for education and whilst we were there, there were many graduates in cap and gown celebrating – a really fantastic experience to be part of. In the evening we had the Vietnam Airlines Gala Dinner. Vietnam Airlines representatives from Europe and Asia were present as well as tour operators from the UK, France and Germany, as well as a few European journalists. We were given a presentation on the new dream liner from Vietnam Airlines as well as information on future plans for the company. Afterwards, we had a Gala dinner accompanied by a traditional Vietnamese string quartet. I had the privilege of being seated with the owner of the Lotte Hotel as well as the Managing Director of HG. 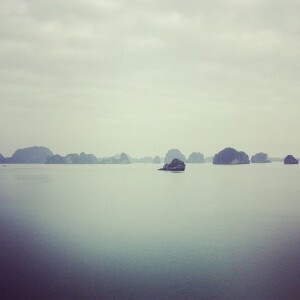 The next day we transferred to Halong Bay. The journey from Hanoi took around 3 hours. Our tour guide John unfortunately could not join us from this day onwards due to a family emergency so were given a new tour guide, Juan. Juan, like John, was a brilliant tour guide and very attentive to us. Both John and Juan really lived up to the standard of the Wendy Wu Tours’ name, and I can really see now why the tour guides are one of the highest rated aspects of a Wendy Wu tour to our customers. On arrival at Halong Bay, we were given our key and then taken to our Au Co cruise ship. Our accommodation on the Au Co ship was pleasant and spacious with private balcony. We were then given an introduction by the Head Manager and provided with a delicious lunch. We sailed out into Halong Bay and I can frankly say that no picture of the Bay could ever live up to the beauty of this place. Truly deserving of its image as one of the most beautiful UNESCO sights in the world, Halong Bay is a piece of true paradise. In the afternoon we took part in a cooking course where we learnt how to make traditional fried pork spring rolls and Vietnamese chilli sauce. We then sat by the bar where the bartender performed some magic tricks. I feel a shout out has to be given to this bartender, who we gave the name Tom Cruise, for his cocktail skills, his brilliant performance, his extremely dry humour and his attentiveness and skills. The next day we were taken out on sampan boats to the floating fishing village. We saw how the local people lived and we had the opportunity to watch the Vietnamese fishing and preparing the fish. On the same day as the sampan boat ride, we returned to our Au Co ship and then were taken on a smaller boat back to Halong city. 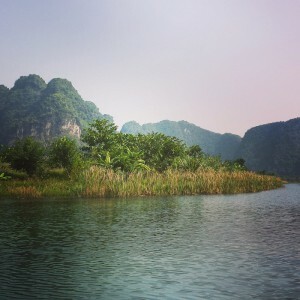 We then transferred 4 hours to Ninh Binh. The route was very picturesque with paddy fields spreading far into the distance, with women in conical hats farming and water buffalos ploughing. There were also many grand Buddhist temples and churches along the way which were fascinating. You could stop at these temples and churches along the way and instead of taking 4 hours, it would take 4 days as there was so much to see! 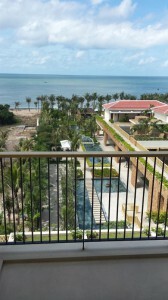 We arrived into Ninh Binh in the late afternoon and checked into the Emeralda Resort. The Emeralda Resort was a very green and eco-friendly luxury resort. There were electric golf carts to take you between the accommodation and the reception/restaurants and each room was its own little bungalow. The room itself was very spacious and had a traditional Asian style to it, with lots of indoor wood and traditional tea pots and Buddhist art. We ate this evening at the hotel restaurant which was called the Hanoi Street Market. There were a number of dishes available all in the style of Vietnamese street food including spring and summer rolls, hot pot, Vietnamese pancakes and pho. The next and final day of our trip, we travelled to the Trang an landscape project. Trang an has only this year become a UNESCO World Heritage site and was honestly to me the highlight of our trip. 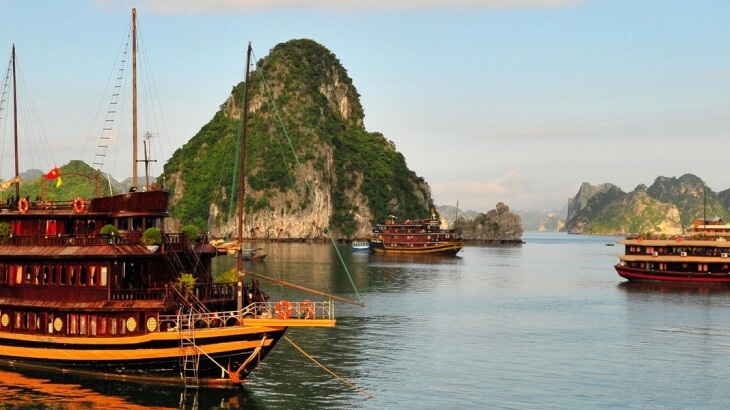 Like Halong Bay, there are many limestone rocks which has actually given Trang an the nickname of ‘Halong Bay inland’. We were taken on a 3 hour sampan ride down the river where we were taken through thrillingly-low caves, stunning landscape and lush green vegetation. Trang an is a truly serene, calm and tranquil destination; I felt I was in an Asia once known, with few tourists, the humming of the birds and dragon flies and the beautiful reeds and lily pads floating gently on the water. I had a fantastic time in Vietnam! Athough I was only there for a short period of time, I felt I really got to experience a new culture in depth. As mentioned above, a true highlight for me was the Trang an landscape project. Trang an could be done as a day trip from Hanoi, or as a 1 night stay on your Vietnam tour. We have a selection of wonderful fully inclusive Vietnam tours on our website. Visit Vietnam with the UK’s leading Asia Experts, Wendy Wu Tours. Our award winning escorted, fully inclusive tours visit all the major sights of Vietnam for an unforgettable holiday. 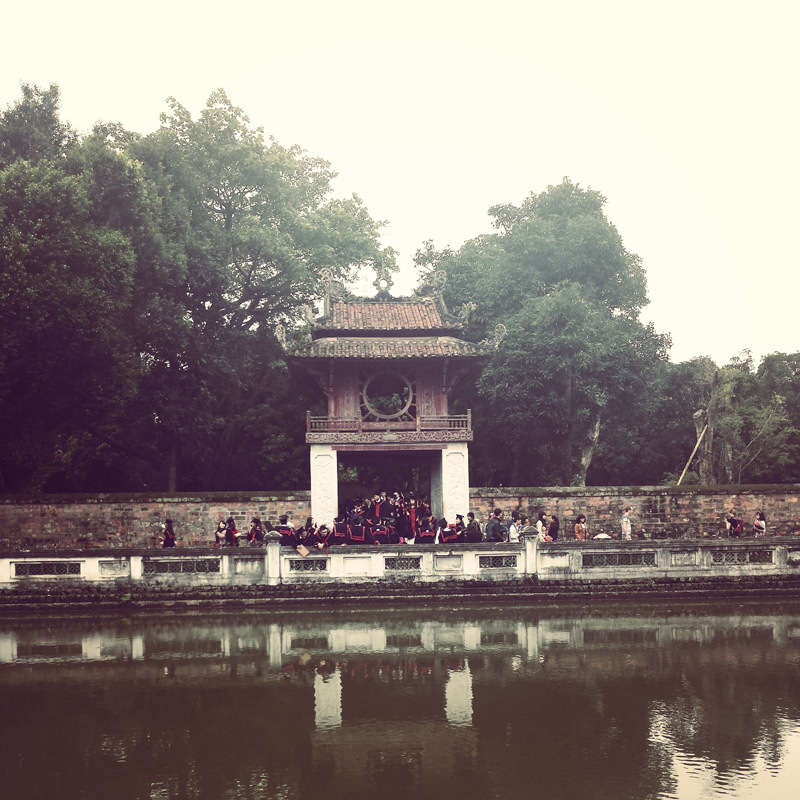 Vietnam fam, unesco heritage site. permalink.